These four books form part of a series which includes two more books: Our Green Saviours and How Blue is our Planet? 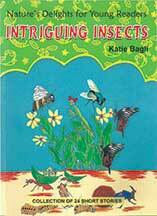 The first impression of these books, with their workbook size, glossy paper, colourful layout and delightful illustrations done by the author, is that they are for young readers and indeed this is what the caption on the books says: Nature’s Delights for Young Readers. 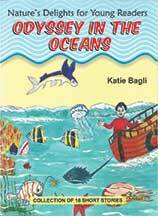 True, the messages of the short stories are simple and are aimed at children, as is the layout with information boxes before each story and interesting tidbits about the mammal, bird, insect, or ocean creature entertainingly related in first person – occasionally accompanied by amazing facts that serve as icing on the cake. However, one has to spend only a little while going through the books before one realizes that they are much more than a simple collection of tales and snippets for children. They are a body of work conceived and executed by someone with a wealth of knowledge and there is something new to learn on practically every page. It is not surprising that the author is a self-confessed ardent nature lover. 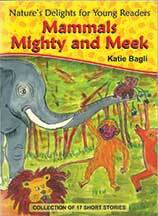 Her love of the environment and every creature in it shines through and inspires and educates readers. 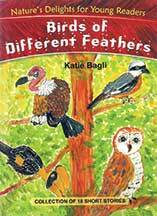 The introduction to Birds of Different Feathers has been written by Bachi Karkaria, who takes the reader on a journey from her first encounter with Katie Bagli to the time she blossomed into an ardent nature lover herself. She was obviously captivated by the author’s knowledge and enthusiasm for the preservation of all forms of animal life – as the reader will be too, by the end of the books. Whether you are reading the story of the vultures or the poem about the flamingoes, whether your encounter is with a yak at the top of the world or the gentle giant of the sea, whether you sympathize with the papa sea horse or root for the Blue Streak fish, or whether you find the wasps and the ants and the silkworms and the dragonflies the most intriguing, remember that you are setting out on an adventure of your own into a world most of us have taken completely for granted because it has been around us for millennia. The striking aspect of these books is the concept of fiction and poetry with animal/bird/fish/insect characters, at times interacting with humans, at times on their own, and then the addition of facts about different species is something that is unique and lends the series its charm. However, young readers may struggle with the language and the turn of phrase used by the author in the series. For independent readers, it is probably more appropriate for the age group of 12+ or for precocious readers, but anyone who has the support of teachers/parents to help them with unfamiliar words and expressions will also benefit from these books. It is a valuable addition to individual and school libraries for the wealth of wisdom that it presents. One cannot come away from even a cursory look at the books without indelible images being stamped on the mind and a number of resolutions being made to look out for the birds around us, appreciate the insects we crush so easily under our feet, or maybe go on to work actively for the environment, as the author has. The reviewer is a children’s writer. She can be reached at cherbrag@yahoo.com.